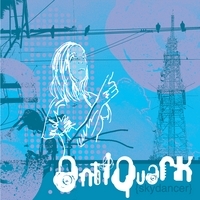 The new CD of San Diego-based duo AntiQuark has been released in physical and digital format. They had asked me a while ago (when they were still a female-fronted duo) to do a remix for them and I did. Now that the main composer of AntiQuark (Ant) got herself a new singer (Sergio) they are ready to attack again with their mixture of electronica, dance, experimental. NJ-based Echstream put up a great show yesterday night at Andrew W.K.-owned Santos’ Party House (basically a big Soho dance club with a good sized stage, two bars, big pillars, great sound system and impressive array of hanging speakers – not used for the live performance). I had heard their records (now available in a remastered version) but I am happy to report that the album translated well on the stage (unlike some other similar bands who without the studio production inevitably lack live). This is probably in part due to the fact that Echostream gainfully employ, not one, but two drummers (female on acoustic drums and male on electronic). The female fronted five-piece is also backed by a skilled and glamorous Japanese guitarrist and by the main songwriter of the band Tony Grund who plays bass lines and synth lines on a small midi controller that he juggles around on a duck-taped stand as if it was the joystick of a sick action game. Last but not least the female Japanese lead singer also does a great job at keeping the crowd excited and paying attention to her melodies and words. Speaking of crowd, the young NY goth and loli-goth scene was all there to represent, dressed in either rigorously all black or in sparkling, super colorful short and tight outfits (imagine Tokyo fashion meets Berlin Love Parade). Given the headliners (the Japanese electro-rock band Blood) the audience was made up of a substantial Japanese envoy. The event was organized by Tainted Reality, who did a great job at putting it together. I didn’t stay for the other bands (when the Australian Japanese duo GPKISM took the stage with their monotone all-programmed dance beats, less than impressive vocal performance and cheesy distorted electric guitar one-note-at-a-time lines I knew that was my cue). I never saw Blood and they sound ok when I googled them today but when somebody told me yesterday that they sounded similar to GPKISM, I wasn’t about to stick around through that and DJ SiSen for a possible disappointment. I think Echostream would probably have turned out to be the best band of the night and that’s who I was there to see anyway. There’s just something to be said for live performances, you know?